Purchase a paperback version of Cloudbreak, California from owl canyon press. Purchase a paperback or download a Kindle version of Cloudbreak, California off of Amazon. Purchase a paperback or downlaod a Nook version of Cloudbreak, California at Barnes & Noble. 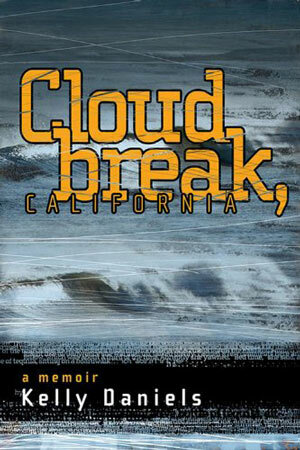 Purchase a paperback of Cloudbreak, California at Indie Bound. "Identity issues, father-son relationships, and surfing are themes that resonate in this fascinating recollection of a young man's coming of age ... This is an entertaining and well-crafted memoir ... Daniels's story will resonate with readers." "Like Spalding Gray's monologue Monster in a Box, Cloudbreak, California is essentially a chronicle of avoidance – a series of diversions from issues that are occasionally referenced but never directly addressed, written artfully with the clear eyes that introspection and distance provide." "The opening chapter is a grabber, and once it's got you, the book that follows, hurtling off on a happenstance journey through Central America and back, won't let go. Kelly Daniels has written a memoir built for speed, but also one wise enough to know not to outpace its artfully understated emotion." "To go from aimless, boozy wanderer to the author of a memoir as open-hearted and beautifully written as Cloudbreak, California, is a remarkable accomplishment. Kelly Daniels is living proof that life really does provide second chances if one has the guts and raw talent to go after them." "The writing is compelling, peopled with a pantheon of fellow drifters and down-at-their-heels natives ... Readers come to care about the young Daniels and his struggle to find his niche in the world." "Kelly Daniels's Cloudbreak, California comes at you like breakers on the shore. It's a memoir that reads like a Beat novel, but with more heart and more guts. A story about family and love and finding your way, it's also a manual on how to become a writer. And how to become a man." "... As a young man with more than his share of nerve, he outwanders even his hapless father, and his remarkable life story comes within a hair of being a death story enough times to keep the reader breathless. Daniels's sure-handed demotic prose shimmers into poetry in the scenes where he finally learns to surf with his aging father." "Daniels is an amiable narrator ... who knows and evokes a real understanding of the water and coastal towns of the Pacific." One day during his ninth-grade Speech class Kelly Daniels's outlaw, soul-surfer father appears at school unannounced and pulls the boy from class. Speeding down the freeway, Daniels's father admits that he has been involved in a crime, but he does not remember how it happened. He'd been up for days on cocaine and booze, he explains, and the next thing he knew he woke up in jail with a bad feeling. It was almost a relief when the guard told him he'd killed his cousin Barkley, a drug kingpin of sorts. "I'm sorry to lay this on you," he tells the stunned boy, "but I'm not going to be around to watch your back. Barkley has a son your age...and this kid might come after you someday. You're going to have to learn to look after yourself." A few days later, the father skips bail and flees the country. "Forget about him," everybody says. But the boy doesn't forget. Someday, he believes, they'll find each other, the fugitive father and the dreamy son, and together they'll surf perfect, faraway waves.